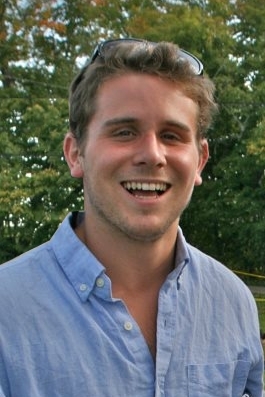 UVM student Erick Crockenberg ’14 has received Honorable Mention status in the 2013 Udall Scholarship competition. This nationally competitive scholarship acknowledges sophomores and juniors who have been outstanding leaders and who have demonstrated excellence in the classroom. It is the most prestigious undergraduate award available for students who are pursuing careers focused on environmental or Native American issues. Crockenberg has been a leader and a change-maker on the UVM campus and in the Burlington community when it comes to implementing energy efficient systems. He, along with current undergraduate student Tad Cooke ’14, have submitted a proposal to the city detailing a plan to repurpose the defunct Moran Power Plant into an energy net-zero building that would house local businesses and non-profits. The building would be run using biomass energy produced from food waste the businesses within the building create, as well as through local urban waste. Crockenberg has been rethinking how energy produced from biomass (in a process called anaerobic digestion) can make businesses operate in a more energy efficient manner in 2011. That year, he and Cooke were awarded a Public Research and Creative Endeavors Scholarship (the award is now the Simon Summer Research Fellowship) through UVM’s Office of Undergraduate Research to pursue research on energy capture with existing compost management at Bread & Butter Farm in Shelburne. They found a way to convert the energy waste the farm produced daily to power other farm activities (such as growing food in a greenhouse during the winter). Creating a system that would foster increased agricultural energy independence while also enabling year-round cold climate food production has huge potential significance for local farmers, businesses and universities. Since then, Crockenberg has worked to implement projects to use and reuse organic materials to reduce the cost of energy at UVM. In 2012 Crockenberg and Cooke received first place in UVM’s Clean Energy Fund competition for their proposal to research and then build a carbon-negative, compost heated production and research greenhouse on UVM’s Horticultural Farm. The project will break ground this spring. On campus, Crockenberg has been active in areas beyond energy efficiency. A Charlotte, Vt. native, Crockenberg is a co-founder of the Ecological Design Summit, and he is also a wilderness TREK leader and a UVM Outing Club leader. He self-designed his ecological food and energy systems major, and he is currently a renewable energy policy intern at the Vermont State House. After graduation, he intends to create a non-profit redevelopment firm that works with communities to implement projects that repurpose older, under-used spaces into structures that integrate local food and renewable energy production projects (similar to his Moran Plant proposal). The Udall Scholarship is the preeminent undergraduate award given out by the Morris K. Udall and Stewart L. Udall Foundation. Established by Congress in 1992, the foundation seeks to support scholarship and excellence as it relates to national environmental and Native American policy. Crockenberg is the seventh UVM student to be honored in the Udall Scholarship competition since its inception. He is preceded by Tad Cooke ’14, Tyler Wilkinson-Ray ’12, Colin Arisman ’12 (Honorable Mention), Joanie Stultz ’12 (Honorable Mention), Zachary Ewell ‘08 and Kesha Ram ‘08. Out of the 488 students nominated by universities to participate in the 2013 competition, 50 students were named scholars and 50 students were given honorable mentions. This entry was posted on Monday, April 15th, 2013 at 11:40 am and is filed under Uncategorized. You can follow any responses to this entry through the RSS 2.0 feed. Responses are currently closed, but you can trackback from your own site.